This fragrant, spicy dish reheats wonderfully. Freeze remaining coconut milk for another use. Tamarind can be bought in many different forms. I prefer the tamarind concentrate found in Asian stores. Kemiri (also called candlenuts) are the nuts used in Malaysia; Brazil or macadamia nuts make a fine substitute. Although the recipe calls for belachan (shrimp paste) I found anchovy paste to be a good alternative. 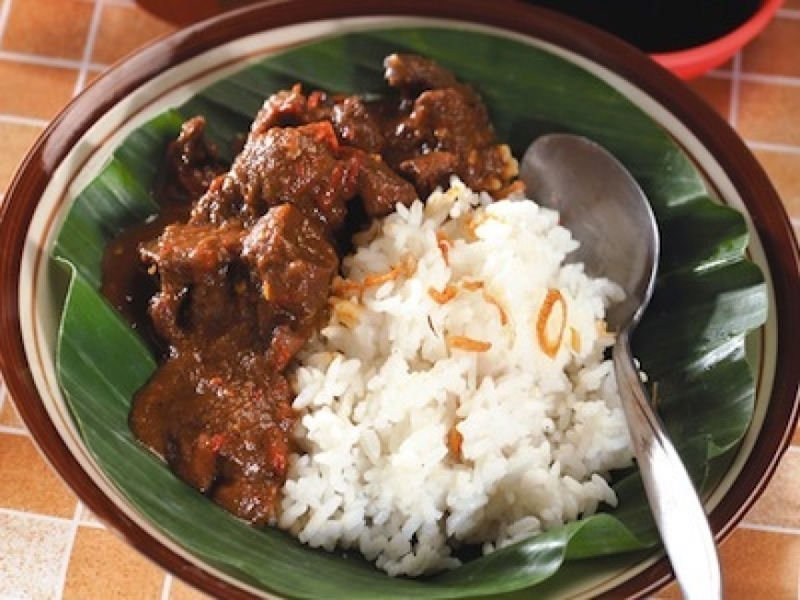 Serve with rice and sambal. Combine coconut milk, 1 tbsp tamarind liquid, onion, garlic, nuts, chili, coriander, salt, sugar and anchovy paste in a mini-chop and process into a smooth sauce. Reserve sauce. Cut off bottom 3 inches of lemongrass, cut into 2. Smash with the back of a knife to release flavour. Heat oven-proof skillet over high heat. Add oil. Season beef with salt and pepper. Working in batches, sear on each side until brown, about 1 minute a side. Remove meat to a plate. Pour sauce into skillet and bring to a boil. Stir in beef, curry leaves and lemongrass. Cover and transfer to oven. Bake for 1 1/2 to 2 hours, or until beef is tender. Reheat when needed. Add water during cooking if the sauce evaporates too quickly. Sauce should be thick.